Our first peek at the Wii U’s achievements system? See that yellow “Cleared in under 100 second!” bubble in the above screenshot? 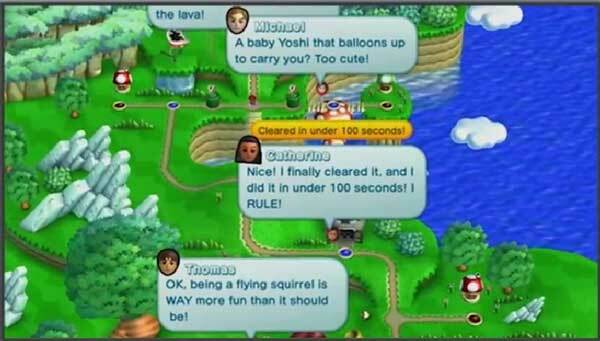 Word on the street has it that this is our first look at the Wii U’s achievement system. The screenshot of what appears to be New Super Mario Bros. Mii comes from Iwata’s Nintendo Direct presentation. While it is unknown whether it is a real game or not, it looks quite polished and I wouldn’t be surprised in the slightest if it turned out to be a launch title. We’ll find out tomorrow! The baby yoshi and the flying squrral is the thing we care about!!! I like this Miiverse a lot. that’s just awful looking. Achievements have to jive with the other 2 consoles for 3rd party games or Nintendo will again be the odd man out… and say what you want about achievements/trophies …. most love them.